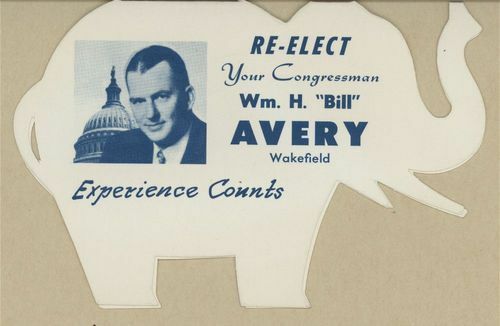 An elephant shape campaign card promoting the re-election of William Henry "Bill" Avery to Congress. As a congressman, Avery served in the Kansas House of Representatives from 1951 to 1955 and the U.S. House of Representatives from 1955 to 1965. In 1964, he was elected the thirty- seventh Governor of Kansas 1965-1967.